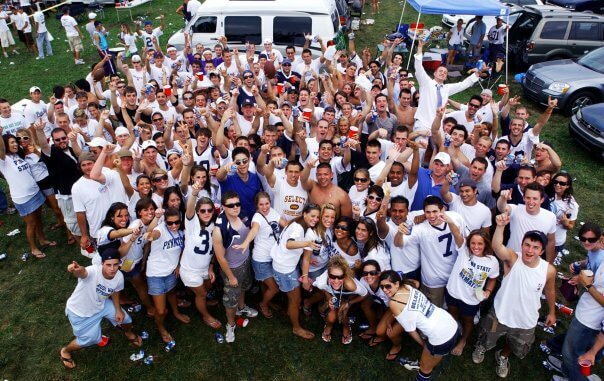 More than 100,000 people come together for Penn State football weekends. It doesn’t matter who we play—Beaver Stadium packs a sea of blue and white and the same notorious groups of people always show up. 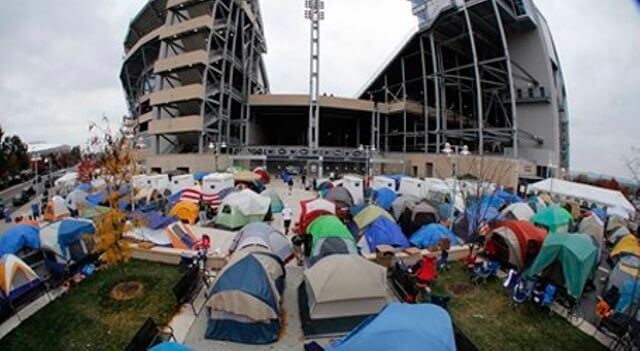 Before each home game, hundreds of Penn Staters register to camp outside of Beaver Stadium. Yes, legitimate camping—setting up tents and sleeping overnight on the concrete from Wednesday to Saturday leading up to the game. On game day these are the most enthusiastic (and not hung over) fans, entering the stadium for front row seats at 9 a.m. when most people are just rolling out of bed with a pounding headache. 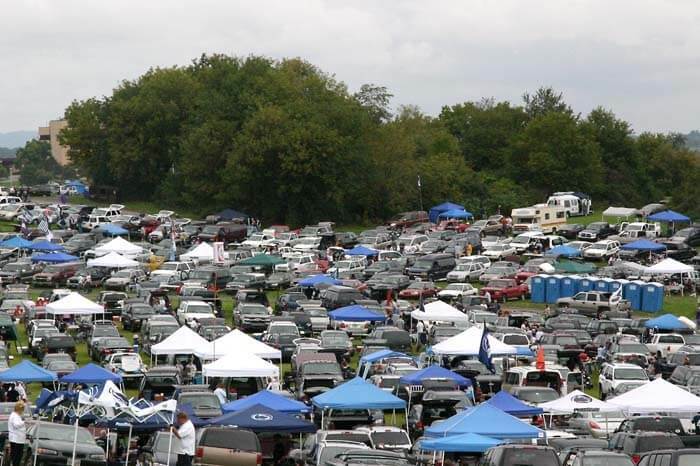 Taking up entire soccer fields and multiple parking lots, Penn State tailgates take place before and after games despite any weather conditions—snow, rain, heat—we’re out there. When alums pull into town on Thursday with their campers—some painted and decked out in Penn State gear from front to back—you know it’s a football weekend. With grills cooking up steaks and burgers, a TV setup and mounds of food spread across entire tables, these alums hold “dear Old State” very close to their hearts. Older generations walk through State College on football weekends like they graduated just yesterday. Considering they all wear identical outfits to the fraternity tailgates, sorority girls don’t need to put much effort into planning outfits for game days. When they walk into the game together, it’s hard to decipher who’s who. All you see are faded shorts with cropped t-shirts, white knee socks and white Converse with backwards Penn State hats. Oh, and last night’s hair and makeup. Between randomly breaking out in “WE ARE” chants and not knowing when enough is enough of drumming the infamous “P-S-U” beat on the cowbell, these guys are Penn State football’s biggest fans. Though some are simply obnoxious, most work toward getting the crowd hyped up and typically succeed. The student section can never distract the opposing team enough—these overly excited guys lead the way. Whether it’s a two-month-old baby or a golden retriever, you’ll see a large amount of Nittany Lion costumes roaming the streets outside of Beaver Stadium. 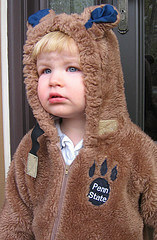 Prepare for twenty little kids (or students) roaring with tails, ears and paw print gloves, imitating the Nittany Lion himself. People are up and drinking the day away by 8 a.m., regardless of whether it’s a noon or 3 p.m. kick off. When you mix college kids with drinking for four plus hours, you get people taking naps at the tailgates or walking in circles because they can’t find the stadium. Freshmen tailgaters don’t know what hits them. When they try keeping up with the big boys in flip cup, they wind up drunkenly tripping on the way to the stadium where police officers hand out under-ages left and right. 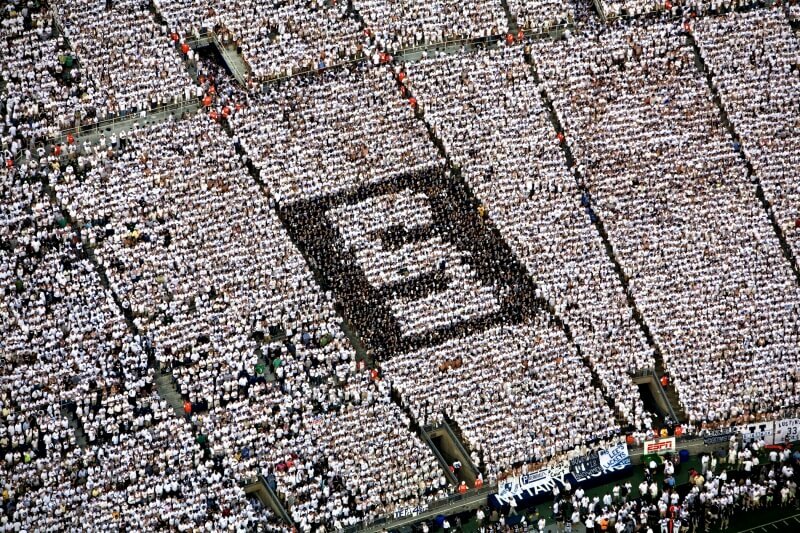 Fans outside of the student section can see a giant ‘S’ created by student fans who enter the games earlier than everybody else. 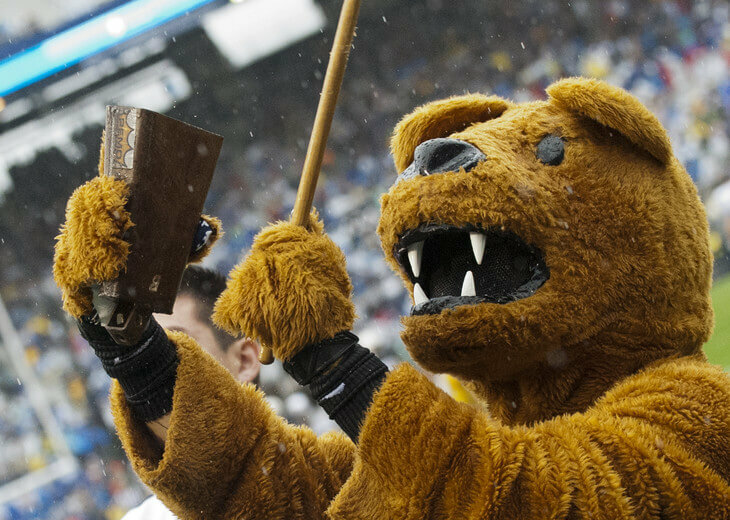 Arranged by the Lion Ambassadors, the S-Zone is present at every game, rain or shine, and is just another illustration solidifying the amount of pride and spirit Penn State has on game days. If it’s a game benefitting THON or Military Appreciation Day, the Lion Ambassadors take the S-Zone to another level, adding an entire section with a cancer awareness ribbon or the letters ‘U’ and ‘A’ on either side. From anywhere in the stadium or on the big screen, at least one group of guys or girls can be seen painted from face to waist in white paint with either ‘We Are,’ ‘Penn State’ or a player’s number drawn in blue. These guys are even willing to bear the numbing sensation of snow to illustrate their love for the team.